Last year around December, I began having chronic chapping of my upper lip. I thought maybe it was simply because of the cold season. It’s still cooler than usual in the Philippines in January and February, and I still had chapping, peeling and stinging feeling on my upper lip. I just tried to ignore it, applying lip balm as often as I could, hoping that it would heal and be gone with the dry season. It’s summer and I still got red, irritated, peeling upper lip. It was as if I applied lip liner on my upper lip, without coating it with lipstick, plus there was visible peeling. How unsightly. 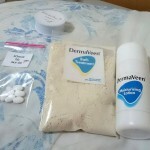 What’s worse was that the chapping was becoming painful, even worse compared to what I had in dry season. It was painful to open my mouth to eat, or to even smile! 🙁 My upper lip crack when it’s stretched. 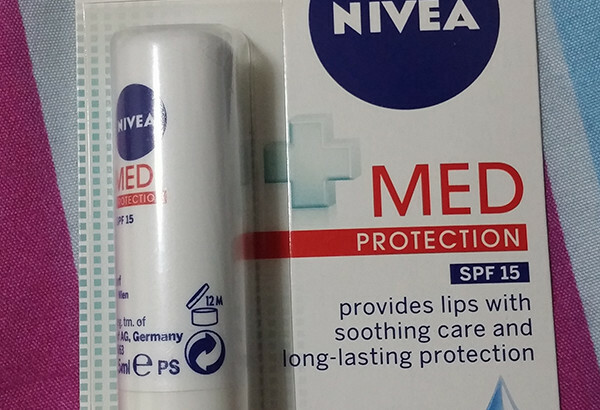 I asked an office friend if she knows of any remedy for it, and she lent me her lip balm – Nivea Med Protection. I was embarrassed to use it at first, like, “is it okay for me to use yours?” I mean, a lip balm is a little bit too personal to share sometimes, right? xD But since I was already getting frustrated with the look and pain on my lip, and my kind friend seemed really okay with it since she saw how miserable the state of my lip was… I used the lip balm. It was like a magic lip balm! It glided on smoothly on my lips — the texture was buttery smooth, while the scent was very subtle but smelled so nice! My upper lip was in a bad state that morning. Like I said, it looked like I lined my upper lip with red lip liner, and the peeling was visible. 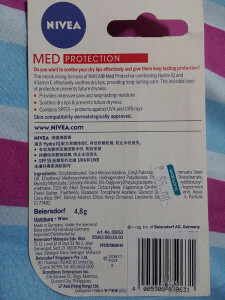 Nivea Med Protection did not conceal the redness, but it did make the peeling much less visible. I applied the lip balm on my lips several times that day since morning. Around 5PM I felt that it’s really starting to heal. I passed by a Watson’s section in SM before going home and I bought my own Nivea Med Protection lip balm. 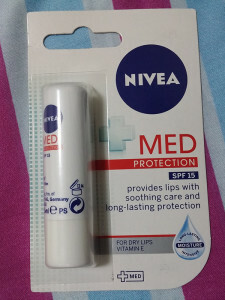 One Nivea Med Protection lip balm costs 95 pesos. In the evening, around 8 PM, I felt as if my upper lip never got irritated during the day! I could finally smile without feeling my lip cracking. 😀 It still seemed a little bit red, and hurt a bit when I apply pressure, but felt perfectly fine otherwise. 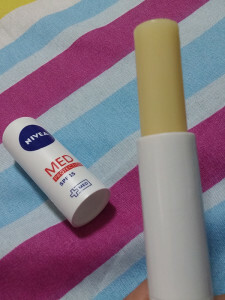 I used Nivea Med Protection lip balm everyday since then and the chronic chapping of my upper lip has not come back yet. Yay for me! Well, it still does peel a little bit everyday… which I think has been what’s “normal” for me for years. But that painful cracking lip condition is the one that hasn’t come back yet. // UPDATE, 2016-04-13: Again, I’ve been getting mildly irritated upper lip from time to time, with redness lining it. 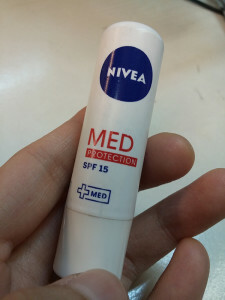 But as long as I keep applying Nivea Med Protection on my lips, it keeps the irritation from getting worse. I’m so glad I discovered such product!